in NYC for years and years. It's never ticked a tock! 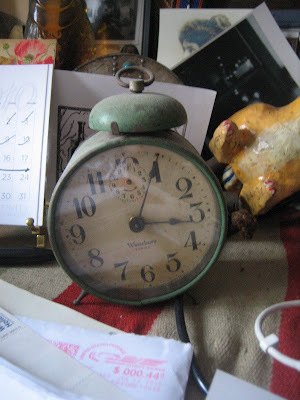 Why is that I love winding up old clocks and watches? The loud tick- tocks somehow make me happy, except late at night when those of my husband's favorite wind-up can be an assault on sleep. (They never seem to bother him!) In our old house in upstate New York there is a Grandmother's Clock that was bequeathed to us by Helen the former owner who had lived there all her life. She pointed the clock out to me on our first visit. It sat cozily over the living room mantlepiece in a niche that was once, I suspect, a little cupboard. It was a gift from a friend of hers who suggested she might have an old clock that would fit perfectly in that space--and it did! The first thing I do when we arrive at the farm is to take the old key and wind it up. The slow movement of the pendulum swinging back and forth is for me a sign that our home is once again breathing. I've been thinking about this today; it's wonderful, really. Helen's friend's clock in the niche, the tick-tocks late at night, the pendulum swinging back and forth. The winding or not winding, the breath of the house. It's another way to celebrate life. We're here, the clock is ticking, we're using the moments the best we can. Being this aware of time passing and loving it is one of the sweetest forms of joy, isn't it? The thing is, too, whether things are ticking or not, we can look at the face of the clock and be reminded that time will pass. Why not treasure it?